Gated gulf front home in Blue Mountain Beach, FL. Located on the quiet west end of 30A, this gulf front home features 5 bedrooms, 5 full bathrooms, 2 half bathrooms. 2 master suites, incredible gulf views, and 3,786 sq,ft. of heated and cooled space. Built by Davis Dunn the kitchen has been professionally designed, provides ample storage and plenty of privacy within this gated community consisting of only four homes. 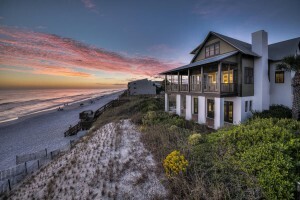 This is your opportunity to own a beautiful 30A gulf front home. Contact us today to schedule a private showing of this Blue Mountain Beach gulf front home. Contact us at The Beach Group at 850.231.9007 for more information on 30A gulf front property.